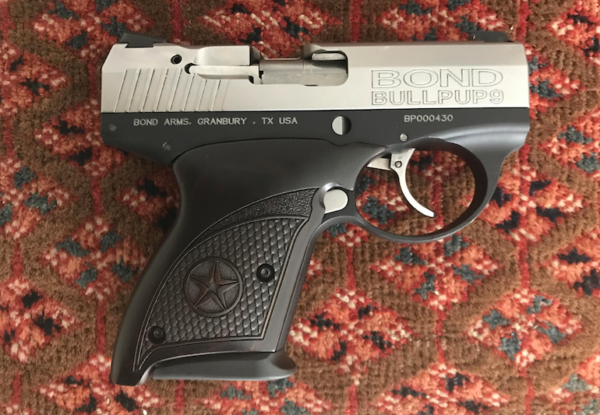 The Bond Arms Bullpup started out life as the Boberg XR9. TTAG reviewed Boberg’s ballistic bauble back in 2012. We were not impressed. The author’s jam-o-matic experience would soon be shared by Boberg customers. While the design was interesting, the XR9 wasn’t ready for prime time. Enter Gordon Bond . . . Bond Arms makes the world’s best derringers. Gordon’s guns are tanks, boasting solid design, world class machining and extreme product testing. Not to mention Texas-style go-the-extra-mile-for-a-smile customer service. None of which applied to the Boberg XR9 or its founder’s customer relations. Gordon Bond wanted to break out of his niche (there’s not much more niche than fairly large, heavy, two-shot derringer). Gordon took a shining to the innovative XR9. Well, not the pistol as it was. The pistol as it could be . . .
I’m not sure what engineering and construction challengers Bond Arms faced trying to fix the XR9, but I would have bet they were significant. And I would have won that bet. Bond Arms world champion cowboy action shooter Garrett Martin told me that the “new” Bond Arms Bullpup is the company’s ninth or tenth iteration of the XR9. Man, I hope it was worth it, financially. Because shooting it totally is. But first the tech spec . . . The Bond Arms Bullpup uses a locked breech, short recoil design with a rotating barrel. The set-up spreads the recoil over a longer time period while reducing the amount of space occupied by the mechanism. The Bullpup’s barrel has a lug that runs in a channel in a locking block. After the cartridge ignites the barrel rotates 14 degrees, then unlocks and allows the slide to travel to the rear. Ejection and extraction are similar to most semi-auto pistols. That tiny spring is not a recoil spring. It’s the slide return spring (with a service life of around 8k rounds). The Bullpup’s barrel is 3.35” long — in a gun that stretches a mere 5.1”. That makes the 7+1 Bond Arms Bullpup roughly an inch shorter than the 6+1 GLOCK 43, whose barrel is a measly .04″ longer. The slide moves easily; an arthritic septuagenarian could rack the Bullpup. If you know someone who has difficulty chambering a round in a semi-automatic pistol, this is the semi-automatic pistol for them. I was going to ding the Bullpup for not having a ledge rear sight for single-handed slide racking. I can’t. The slide is so easy to move that even the small amount of vertical space on the rear sight provides enough grip to fully cycle the slide. What makes the Bullpup a, umm…bullpup? The gun draws the next cartridge backwards from the magazine and lifts it directly inline with the barrel. Yeah, but the Bond Arms Bullpup isn’t a 30-pound machine gun. It’s a tiny pistol. I’m pretty sure that makes it one of a kind. The Bullpup’s magazine is actually a “magazine-clip” (clip-a-zine?). There’s no follower because it doesn’t need one. 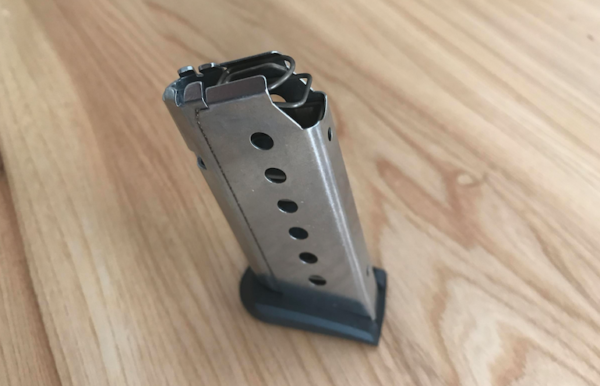 The rounds insert forward into the magazine, with the base of the cartridge out and open. The Bullpup’s trigger doesn’t feel like a 1911, or any striker fired plastic pistol I’ve ever fired. The hammer fired double-action-only semi’s trigger feels as smooth and pure and controllable as a Korth’s go-pedal. That’s no exaggeration. The Bullpup’s trigger is that good, right out of the box. The trigger pulls through a revolver-like length of travel (there is no external safety) without any grit or stack, right until hammer time. The stock trigger breaks with 7.5lbs or pressure; customers can order a 6.5lbs. or 8.5lbs. version. The Bullpup’s engraved rosewood scales enable a positive, full grip on the little gun, with the wide backstrap well-positioned along the web of my hand. 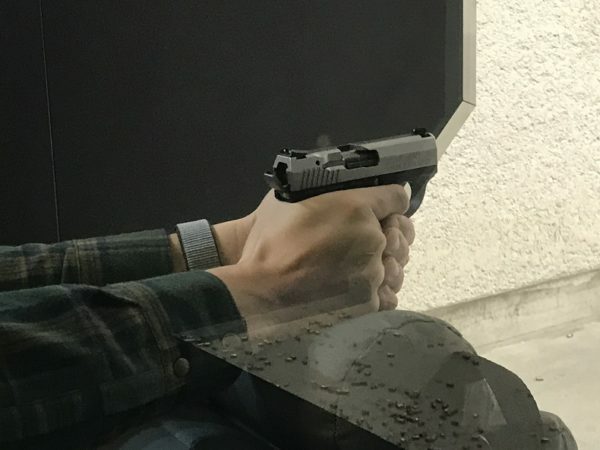 While the gun’s geometry soaks up recoil, the grips’ wide rear also helps control the impulse. And renders the Bullpup less concealable. But not by much. 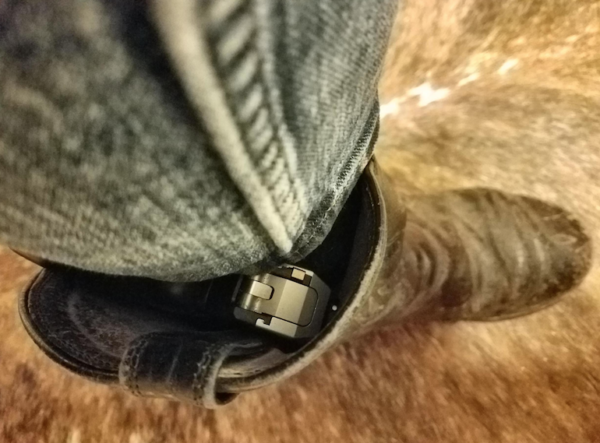 I boot-carried the Bond Arms bullpup and stashed it in an inside-the-waistband holster without difficulty. 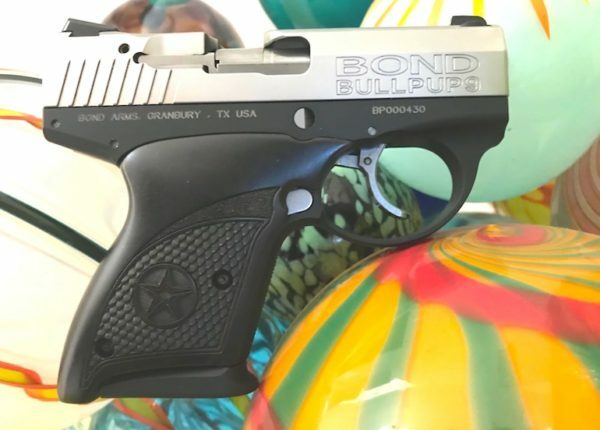 Customers can order the gun with plastic grips only slightly wider than the frame, which would make the Bond Arms Bullpup a true pocket pistol. Even thinner G10 grips are in the works. 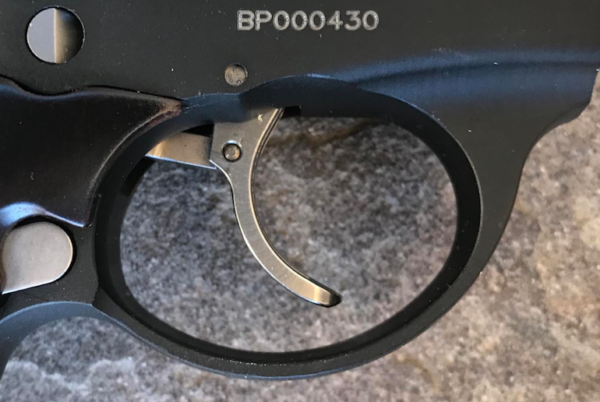 The Bullpup’s sights are a quality drift adjustable 3 dots. They’re large enough to deliver an excellent flash sight picture while still facilitating precision shots — more than you have a right to expect on a pistol this size. 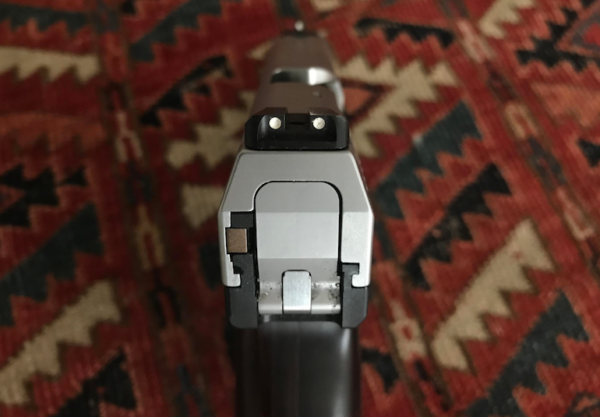 Given that the gun loads by withdrawing the round out of the magazine rearwards, locking back on an empty magazine wouldn’t make any sense. 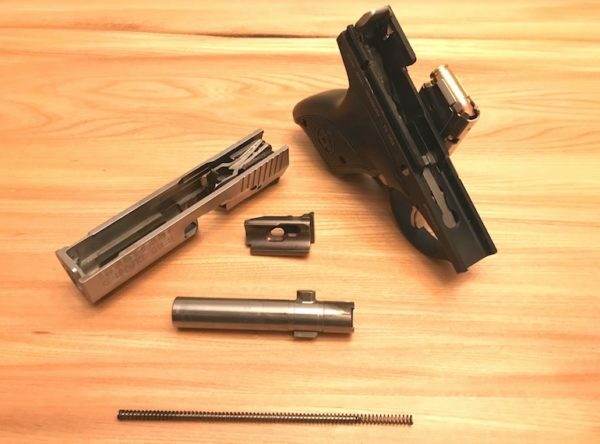 After dropping the magazine, you would still have to drop the slide and re-rack the pistol to chamber a new round. So the Bullpup doesn’t lock back on empty. But it does go click. The Bond Arms website includes a prominent ammunition notice. The issue: the bullet crimp. As previously noted, the Bullpup’s action yanks the bullet backwards to align it with the barrel. Bullets that aren’t well crimped can separate. True story. When RF was shooting IWI’s 115gr die cut ammunition, the mechanism pulled a bullet from the case, spilling the powder out and, obviously, causing a malfunction. RF shook the powder out, cycled the action and kept firing. Since I didn’t know about the notice until later, we just kept shooting. RF and I put at least 350 rounds through the Bullpup. I put another 500 rounds through it since. Only one out of some 400 IWI rounds separated. Truth be told, of the more than 850 rounds put through the gun, not a one was on the recommended ammunition list. I shot the last of my Cap Arms 115gr FMJs, the IMI 115gr Die Cut round, Wilson Combat 124gr +P XTP, Wilson Combat 147gr XTP, Blaser 124gr FMJ, and Remington’s 115gr HTP round. No issues of any kind. I never disassembled the gun or provided any maintenance (I forgot to lube it). I should also note that I almost always ran the gun as 7+1: a full magazine with one in the chamber. Many small pistols, like my Kahr PM9, have issues consistently firing a full load. Not the Bond Arms Bullpup. 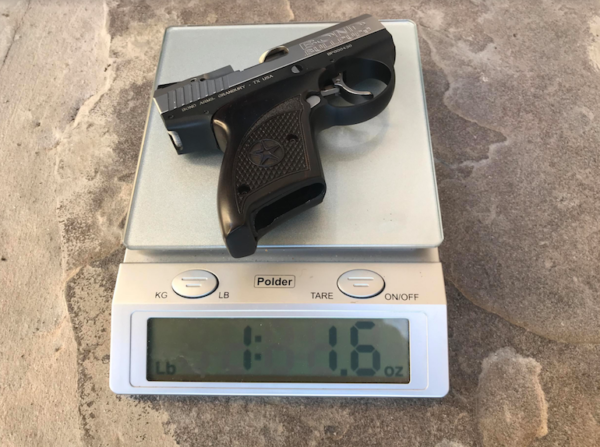 When a 9mm pistol’s total length is smaller than my hand, something usually has to give. Most of the time, it’s accuracy. Not so much with the Bullpup. 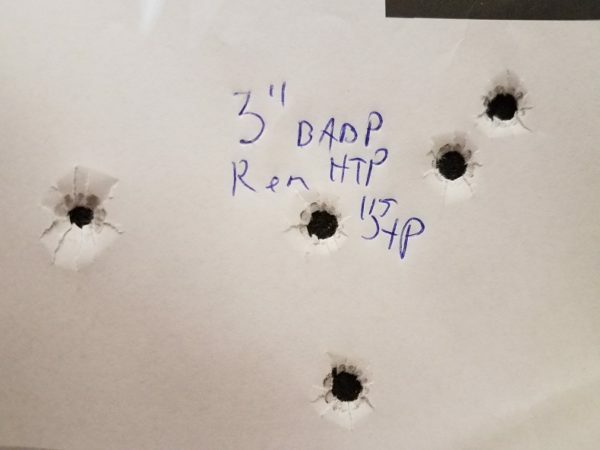 With any of the rounds mentioned, I was shooting under 4” five round groups at 25 yards. The Wilson Combat 124gr +P XTP round printed 3.5” five round groups for a 4 group average. Remington’s HTP round shot just a little better. That one shot a groups right at 3”, but averaged 3.25” because of a few fliers. That’s impressive bench accuracy for a boot gun from the bench. How it performs off-hand is even more remarkable. The Bond Arms Bullpup weighs slightly less than the GLOCK 43, but stays on target far better. There’s simply no “snap” when shooting this gun. It recoils more like a compact SIG SAUER P229 than my Kahr PM9. Gordon Bond didn’t invent the Boberg XR9. He perfected it. The Bond Arms Bullpup is a small, reliable, comfortable, easily manipulated, highly concealable 9mm pistol with an eight round capacity. A gun that’s a lot more than merely accurate at combat distances. At a Franklin over a grand, the Bullpup isn’t cheap. But that’s a price worth paying if you want the ultimate in innovation, quality and utility in an American-made compact pistol. It’s a different sort of gun, but I like it. 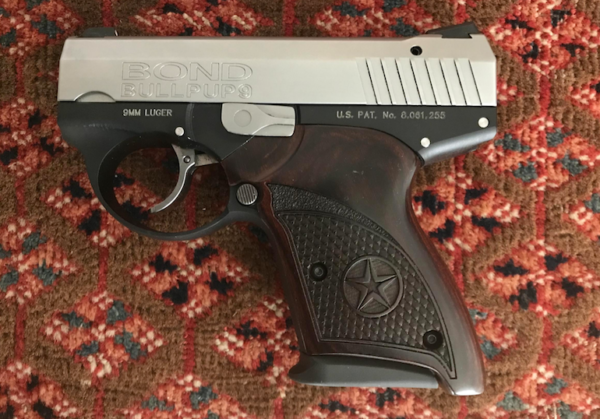 It’s built with the kind of flawless finish and minute attention to detail Bond Arms customers have come to expect. The rosewood grips are high quality, beautiful and functional. So far, you can change the grips to plastic models as well as change the trigger pull weight. More options on the way. The only issue I witnessed was a bullet separation using ammunition not recommended by the manufacturer. I personally shot over 500 rounds through the gun without issue, and all of it with ammunition not recommended by the manufacturer. Three to 3.5” groups from a gun with a total of length of 5” is outstanding. Take into account that it did this with a broad range of ammunition not recommended by the manufacturer. The sight radius is the limiting factor. The Bond Arms Bullpup deserves six stars. It’s the end result of innovation, improvement and attention to detail. Mouse gun size, compact pistol velocity and handling. Outstanding.